A fog dome forms over a frozen lake in Colorado. I love unusual meteorological phenomena. Iridescence, lenticular clouds, Kelvin-Helmholtz waves, and on and on. I’ve been fortunate enough to see a lot of these weird things for myself, but then my luck is leveraged heavily by my tendency to look up a lot and pay attention. There are still quite a few events I’ve never seen, but I’ve heard of them. Asperatus undulatus clouds, crown flashes, more. I’m fascinated by all of these, and because I read a lot about them it’s rare for me to get wind (har har) of one completely new to me. But then BA Bloggee Richard Jarvis sent me a tweet linking to a photo of a phenomenon I’d never heard of: a fog dome. The photo was on the BBC’s Weather Watcher’s site, and it’s weird. As you might expect, it shows a huge dome of fog in the distance, like something out of a creepy movie. The explanation given makes sense to me: Warm water, perhaps in a lake, warms the air above it, which starts to rise due to convection. It’s winter, so the air around it is cold. The moisture-laden warm air cools as it goes up, and the water condenses to form fog. When it cools enough it stops rising, and the rising air beneath it pushes it to the side. It flows down to the sides of the plume, creating the dome. Mind you, I had never heard of such a thing before —it’s pretty rare— and was amazed. But then, less than a week later, something even more incredible happened: I saw one for myself, literally in my back yard! 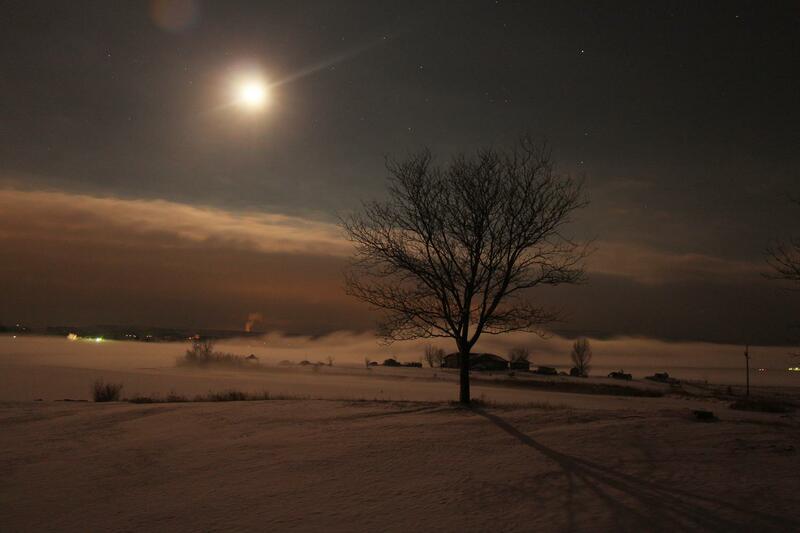 A creepy fog dome lit by Moonlight lurks over a frozen lake. The photo above shows my local fog dome. I took the shot on Dec. 7 in the late evening. My nephew, visiting for the holidays, was looking out a window and said something along the lines of “What the heck is that? !” I went to the window and gasped out loud: It was huge. It may not look it in the photo, but note that’s a two story house in front of it, and the dome is probably half a kilometer away or more. It’s really big, at least 20 meters high. We live near a lake, and that night it was bitterly cold, around -20° Celsius. I’m guessing a thin spot in the ice broke, and the warmer water underneath started up the fog dome process. The main mass of the dome is behind the tree, but I want you to look closely at it, to the left and right of the dome. See the waves on the top of the fog around the edges? Those are caused by air currents over the frozen lake surface. Note the direction they point: On the left, the waves clearly show the air is flowing to the right, but on the right, the waves show it’s flowing to the left. That’s exactly what I’d expect! The air in the middle is rising, so the air all around the dome flows inward to fill in the partial vacuum. That’s what those waves are showing us. Science! Amazing. The shot is a ten-second exposure, and the bright object is the half-full Moon setting in the west. The stars to the right of it in a heptagon form what’s called the Circlet of Pisces, for obvious reasons. The brighter stars to the right of that belong to the constellation of Pegasus. I brightened the image a bit and adjusted the contrast to make details more obvious, but that’s the only fiddling I did. As usual, I have to smile wryly when I hear people try to distinguish art from science. The Universe is both, folks. You may try to tear them apart, but you cannot, for the artistry of the Universe is forever intertwined with how it works. They drive each other; the science is why the art is beautiful, and the art is one of the reasons we pursue the science. I stand by that. And now I can say I stand by it both figuratively and literally.